If you recently lost a loved one, you may find yourself directly involved with the probate of the decedent’s estate if you were named as the Executor in the decedent’s Last Will and Testament. You might also volunteer to be the Personal Representative of the estate if the decedent dies intestate, or without leaving behind a valid Will. To keep things simple, the term “Personal Representative” is frequently used to refer to either someone appointed as the Executor in a Will or someone who volunteers to oversee the administration of an intestate estate. If you have never served as a Personal Representative before, you probably do not know where to begin the process of probating the estate. Retaining the services of an experienced Illinois estate planning attorney is always wise; however, to help get you started, the estate planning attorneys at Hedeker Law, Ltd. have compiled some commonly used probate resources for the Vernon Hills, Illinois area. Probate is typically opened in the county in which the decedent was a resident at the time of death. If the decedent lived in Waukegan that will likely mean probate will take place in the Nineteenth Judicial Circuit of the Lake County Courts. Most Personal Representatives (PRs) retain the services of an experienced estate planning attorney to assist during the probate process, particularly if the estate does not qualify for a small estate alternative to formal probate. If, however, you decide to proceed pro se, or without the assistance of an attorney, you will be expected to understand the local court rules as well as the Illinois and federal laws applicable to the probate of the estate. There are some resources available to you that may be helpful. The Lake County Court system has a Center for Self-Represented Litigants that you will find useful. The Southern Illinois School of Law also has a Self Help Legal Center that may be of use to you. The Lake County Forms Center will have most of the forms you will need; however, it is important to note that the court staff cannot help you fill out the forms nor can they answer legal questions. If your loved one’s estate requires formal probate, or you are unsure how to proceed with the probate process, retaining the services of an experienced estate planning attorney is your best option. Not only can an attorney guide you through the process, allowing you to focus on grieving, but having an attorney on your side also dramatically decreases the possibility of making a costly mistake. A good place to start is with the American Academy of Estate Planning Attorneys website. The AAEPA is a national organization of attorneys who have chosen to focus their practice on legal issues related to wills, trusts, and estates. Membership in the AAEPA signifies that an attorney has proven experience in the areas of estate planning and/or elder law. In addition, the Illinois State Bar Association’s “Illinois Lawyer Finder” as well as the Lake County Bar Association’s Lawyer Referral Service may also be of help finding the right attorney. 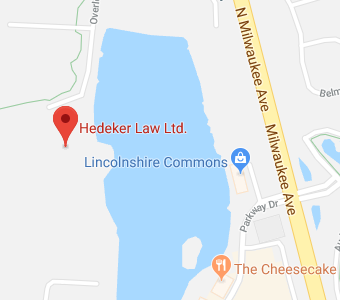 If you have additional questions or concerns regarding the probate of an estate, contact the Vernon Hills, Illinois estate planning attorneys at Hedeker Law, Ltd. by calling (847) 913-5415 to schedule your consultation.